This post is by Cassily Charles from Charles Sturt University where she is the academic writing coordinator for Higher Degree Research Students in the CSU Academic Support Unit. (ie: another thesis Whisperer). In this post Cassily picks up on an earlier post from February on the topic of PhD student as Meerkat – a powerful analogy as you will see. In February I suggested that research students are sometimes a bit like meerkats. 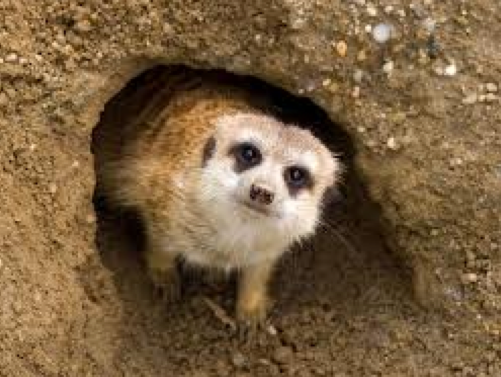 I pointed out that meerkats must move between the zone of safety (the burrow) and the zone of exposure (the rest of the world). In your ‘burrow’, on your own with your research material, you can be as messy as you like, but it’s a different matter when you venture outside. When Meerkats leave their burrow they can never be sure that they will be getting a yummy beetle treat or eagle attack – or both. This is why you should think strategically when sharing your work. Let’s see if we can borrow some strategies from the meerkats that will make getting good feedback easier and less stressful. Meerkats aren’t silly: They get all the beetles near their burrow first. It makes sense for research candidates to start off as close as you can to your own safety zone too. You know how you work best, and that is valuable knowledge – so why not cooperate with yourself, and find out how much you can get your supervisor to cooperate with you. If you are a planner, celebrate your wacky abstract planning process, which will make it faster for you to write when you eventually get to it. If you are drafter, celebrate your drafting. Remind yourself that your writing will gradually become more and more organised and connected as it goes. If you are happiest talking and listening, record your discussions with your supervisors or yourself, then play it back, and transcribe it verbatim before you start writing. If you need to see things laid out visually, take over a wall of the room to stick up your beautiful-mind-map, and add and move things as your ideas develop. A few, very lucky, people have supervisors who can give nourishing feedback close to your home burrow – like supervisors who find out how you work and try to work with you, or just happen to have the same ways of working. However, most people have to make some bigger or smaller journeys away from their comfort zone to get all the feedback they need. Meerkats put time into their social connections – not only for the warm fuzziness of community, but also to share the important jobs and help each other in practical ways. For example, when they are out in the zone of exposure, one Meerkat has the job of sentinel. She watches the sky and ground, ready to give the others advance warning of what is ahead. You might be able to benefit from the help of feedback look-outs too – people who can give you a hand to predict how to get the best quality feedback and avoid dangers. Since you are reading this blog, you are already using at least using the experts and other students who write here as a type of look-out. Have you tried any of these others? Other mentors, colleagues or faculty staff who know you, your supervisor and/or the norms and context of the discipline in which you are researching. Is that a hawk or a pigeon? A snake or a stick? Meerkats are alert to dangers in the sky and on the ground, and they are quick to bolt when the warning cry is given. However, each dash from danger takes up energy, interrupts the business of getting food, and takes time afterwards for everyone to recover. It is definitely worth looking again – is that shadow actually a hawk, or only a pigeon? Similarly, many research candidates are alert to dangers in the feedback process. This is sensible. If you’ve ever had feedback which dented your faith in your abilities, or made you feel alone and misunderstood, or pulled you off track, or wore away your enthusiasm for your topic – then you know that these things can be real injuries, and sometimes even fatal to the research degree. Sometimes feedback can cast a shadow over our work, but it is worth waiting, checking and looking again – just in case it is not the danger it seems. Only ever getting 100% critical feedback. This might just indicate that your supervisor thinks you already know about the strengths of your work. Ask for feedback on the positives – e.g. Am I generally on the right track? What are the things that are looking good so far? Feedback that you are progressing too slowly. This may indicate that your supervisor has just not seen enough evidence of your progress in a form that makes sense to her/him. If you work in different ways to your supervisor, you may be able to find a compromise form, to show that you are indeed on track. Several research students have told me that after they presented their research proposal their supervisors relaxed and trusted them to work in their own way. Lots of corrections on every line of an early draft. This may simply be a sign that your supervisor is ‘crop dusting’, because there is no specific target set for their feedback. Ask for feedback on only the aspects you are currently working on – e.g. Any other literature you should be referring to? Is there too much here for one article/chapter? Do you need to include more detail in the results? Are your claims too cautious or too confident? Meerkats thrive in a tough environment, partly because they are flexible in their diet. They will take their nourishment from anywhere they can get it, whether it’s beetles or worms or scorpions. Sounds like a challenging breakfast – but it’s a good model for broadening your feedback diet. Research candidates need feedback across a spectrum of types at different times during their candidature: facts, encouragement, tough love, inspiration, quality assurance, mentoring, practical help, networking, etc. Most supervisors have their own particular strengths in some of these areas. It’s a rare supervisor who is a one-stop-shop for everything you’ll ever need. So have you considered some other sources of feedback nourishment along the way? Your research heroes – Sometimes they are kind and willing to answer your random email: Dear Professor Wood, your work has been so helpful for my research – could I ask you a question? Other mentors/advisors – from associate supervisors who have some official role in your candidature, to informal mentoring and advice from colleagues, peers and contacts at other universities. But be careful you do not infringe on your university’s conflict of interest provisions on who can be your examiner. So how about you – are you getting all the beetles and worms you need? Do you have any survival stories or strategies you’ve found effective, to get the feedback nourishment you need? Are research students a bit like Meerkats? This entry was posted in On Writing and tagged feedback, supervisors, Writing. Bookmark the permalink. « What if I NEVER get a job? I like to think research is more like an act of a ferret. What about research being like being a cow? You take in other research and data, chew it over and produce milk for future generations to get sustenance from. Oh dear, Ive got a crop duster!! Hmm food for thought or is that fertilizer? It should be the ‘ex’ strategy or the neighbourhood stragegy.